In Peru's Blood Festival, It's The Condor Versus The Bull : Parallels The condor is tied to the bull's back and they fight it out in an arena. Many Peruvians say it's an important tradition. Conservationists call it another threat to a giant bird already at risk. 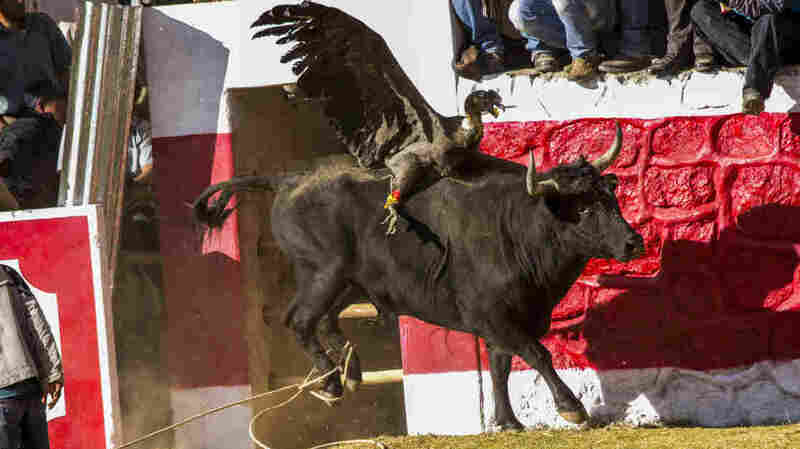 In Peru's annual Blood Festival, a condor is tied to the back of a bull and tries to gouge its eyes, while the bull attempts to shake off the giant bird. The event is popular in many parts of the country, but conservationists say this threatens a bird already at risk. The Peruvian Blood Festival is a striking spectacle, with a giant condor strapped to the back of an enraged bull in front of a roaring crowd. For many Peruvians, it is a symbolic re-enactment of their liberation from Spanish rule. For conservationists, it is yet another threat to one of the world's largest birds. To prepare for this annual event, known as the Yawar Fiesta, residents in the small village of Coyllurqui climb into the surrounding cliffs to trap a condor. It may then be held for weeks. But when it's time for the battle, the condor is given alcohol to drink and lashed to the back of a half-ton bull in an arena. The beast then tries to shake off the condor, while the huge bird attempts to gouge out the bull's eyes. These Andean people believe the condor is a symbol of the Inca nation, and the bull represents the might of the Spanish conquistadors. Though they predominately identify themselves as Christians, villagers see the condor as an Andean god that has come down from the heavens to fight for their freedom. 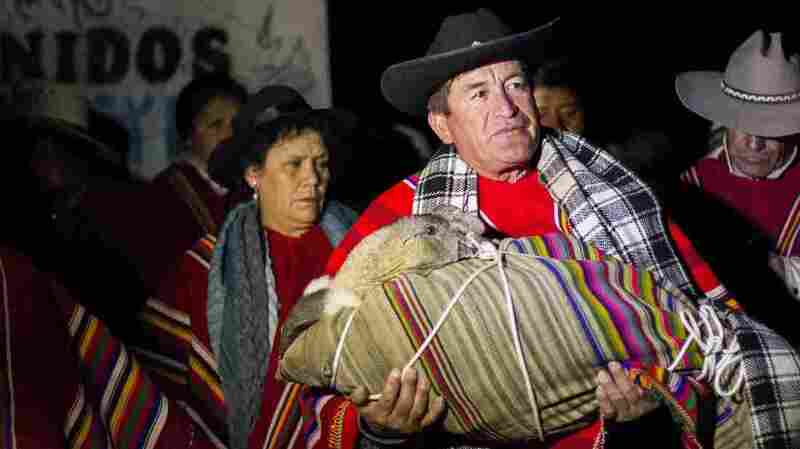 The mayor of Coyllurqui, Walter Bocangel Gamarra, carries the bundled condor in advance of its battle with the bull. There's a lot at stake during the battle. 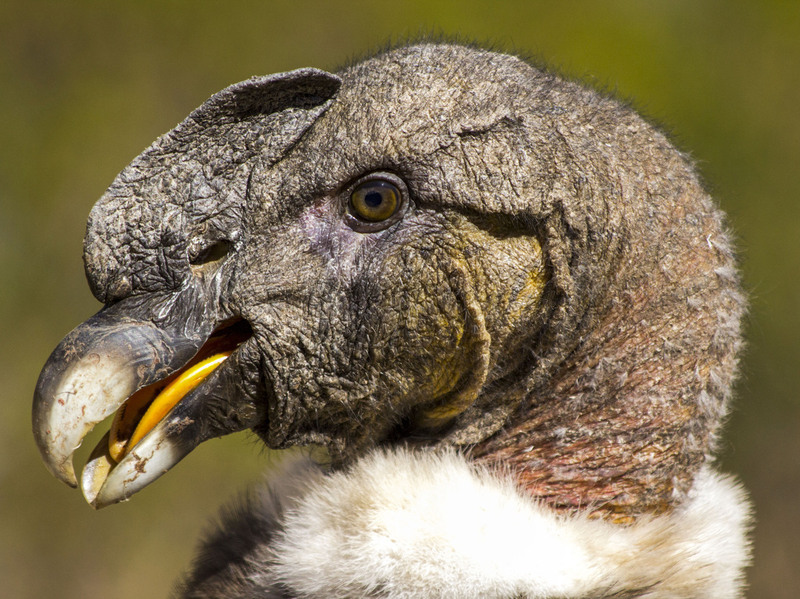 If any harm should come to the condor, the villagers believe it's a bad omen for the year — and the dwindling condor population suffers another setback. Conservationists want to put an end to the Yawar Fiesta in order to help protect the species. But many Peruvians say they want to preserve the traditional event, which takes place every year on July 29, the day after Peru celebrates its independence. No one knows exactly how many condors are left in Peru, but the general consensus is that there are 600 to 1,000 remaining, and their numbers are declining. Condors, which weigh up to 33 pounds and sport an enormous 10-foot wingspan, eat dead animals that could otherwise harbor lethal bacteria like anthrax and botulism. They have long lifespans, reaching up to 75 years in captivity. But they also reproduce slowly — only one chick every other year. Both parents are needed to raise offspring, which demand support for an entire year, said Michael Mace, the curator of birds at the San Diego Zoo Safari Park. The giant condor, which has a wingspan of up to 10 feet, is brought into the ring before being tied to the bull. The condors are released after the Yawar Fiesta, but no one knows the effect of weeks in captivity and a brawl with a bull. After this battle, which lasted less than 30 minutes, there was blood on the ground. But it was not clear whether it came from the bull or the condor. It's not even clear how many of these Yawar Fiestas take place each year, but it could be more than 50. The biggest threat to the condors comes from farmers and ranchers who shoot or poison them after wrongly assuming the birds kill livestock. In fact, the condors are just opportunists that feast on already dead animals. 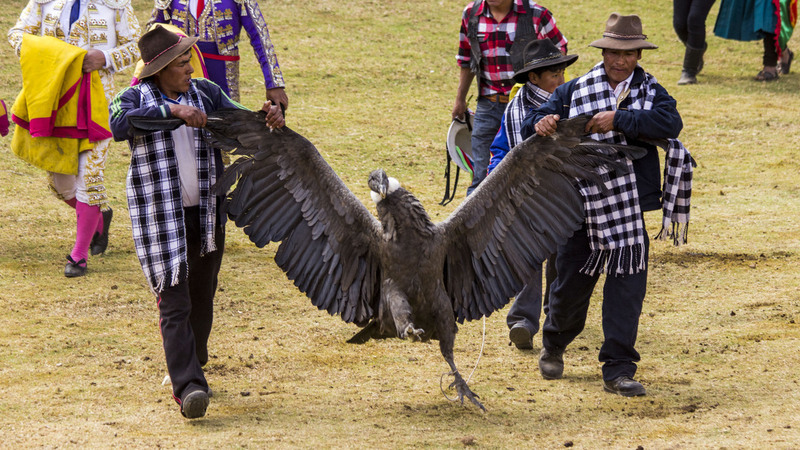 At this year's Yawar Fiesta in Coyllurqui, the condor was far from godlike — it looked rather pathetic. The ropes that held its feet were sewn into the bull's hide, and the bird slumped over, flopping around as the matador goaded both animals into a frenzy. "It hurts me. I am sad to see the bull and the condor," said Geronimo Yucra Nininty, a festival attendee. "I'm against abusing animals." 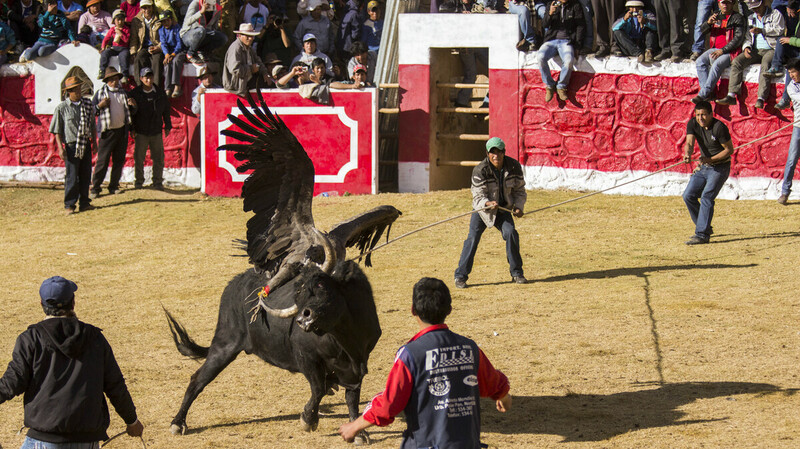 Villagers try to lasso the bull as it fights the condor in Coyllurqui, Peru, last month. In the 1970s, the Peruvian government forbid the capture of wild animals, said Cecilia Larrabure, a photojournalist who is working on a documentary concerning the festival. There are rumblings in the capital Lima that officials might start enforcing those rules, she added. But in remote locales like Coyllurqui, it's difficult to enforce existing laws. The village is a nine-hour bus ride away from the city of Cusco on a mountainous dirt road packed with tight turns. "I think that it is crucial, the protection of the condor," said Coyllurqui Mayor Walter Bocangel Gamarra. "But here we have these customs, these traditions. If there's not a condor, there's no festival." The first record of the Yawar Fiesta was a celebration in the city of Cusco in the 18th century, Larrabure said. Back then, the festival was called "Turupucllay," which means "Game of the Bull" in Quechua, an old, native language. The title "Yawar" is more recent. A 1941 novel of the same name by Peruvian author José María Arguedas popularized the term. In this region, he is reverently referred to as the "Hemingway of the Andes" and most anything connected to his name tends to draw tourists. An estimated 600 to 1,000 condors remain in Peru, and their numbers are declining. This is good marketing for cash-strapped villages wishing to attract visitors. The festival also brings back family members who have left the town. And it can also provide an emotional lift. The history of the Spanish and the Inca is bloody. The Spanish massacred the Inca and oppressed them. Life is still hard in the Andes, where poverty, alcoholism and spousal abuse are common, Larrabure said. "When [the people] put the condor on top of the bull that is a way of saying the Inca is back," Larrabure said. "For them, it's important to have that feeling — at least once a year they can hope." Fernando Angulo, a researcher at the Corbibi NGO who is working on a condor conservation plan, says the festival doesn't have be a battle between traditionalists and conservationists. "Many people are of the idea of prohibiting the Yawar Fiesta to save condors. But I think [the festival] is a great opportunity for education," he says. "We have to look for a more creative solution." Angulo suggests using the festival as a tool to study the condors. The Andean people have local knowledge about the bird's habits and locations that foreign researchers don't. He would like to work with communities to tag and track the birds, educating residents about the ecological importance of condors. Angulo says he hopes this type of bottom-up movement will encourage people to hold the festival — but without the fight. Journalist Mollie Bloudoff-Indelicato is based in Peru. You can follow her @mbloudoff.